Here is profile of another startup here in Iceland. 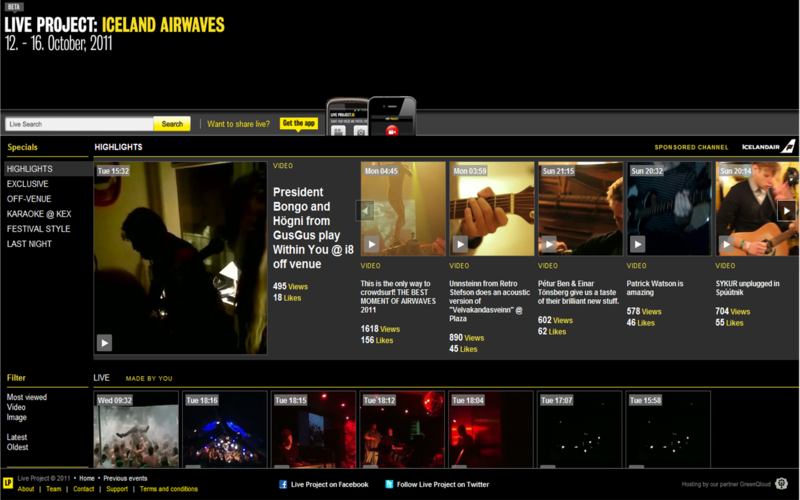 LiveProject.me allows users to stream their experience from a live event like a concert or show. I have met with both the founders, they are designers and creators who gave up their day jobs to be entrepreneurs. I love this concept, allows everyone to turn their iPhones and Android Phones into live streaming cameras. What is so cool about this service is that you get to see the energy of the crowd through which you can feel the show… just brilliant. I advised them on their business model, on scaling and also pointed them to some of the books that I have written about. This is the kind of idea that falls right in the center of my investment thesis. Platforms that are built on top of iOS, Android or any Mobile device. There are so many different ways they can build followings and users. TV stations needs to start noticing this trend make sure that they are investing in this otherwise they will be marginalized. Fred Wilson wrote about one of his portfolio companies Boxee, which is now starting to stream live HD TV. There is a fundamental change that is starting to happen. We had many different ways that content came to us but it was controlled by a few content creating companies and they had gate keepers who sought rent for everything that went through them, now with startups that are disrupting that business model no wonder SOPA and PIPA have become the way to create a scarcity based business model. I think eventually scarcity cannot be a viable business model because of the underlying forces of Moore’s law.